If you are an importer of goods to the UK you may find this infographic useful. It shows the difference between financing your imports yourself and using a trade finance company to fund them. A common problem with importing is that you have to pay for the goods in advance, or on very short terms before you have been able to sell them on. This type of funding solves that issue. The financier pays your supplier for you, giving you a period of credit. You can either repay the finance yourself (if your company has a strong financial position) or your can use your customer invoices to repay the finance. In this scenario, the trade finance company can help you by collecting in your sales invoices and accounting to you for your profit margin. In this way, the finance can be granted on the strength of your customers (not your business). <a href="https://www.fundinvoice.co.uk/list_other/benefits-of-trade-finance-for-importers.html" ><img src="https://www.fundinvoice.co.uk/images/infographics/benefits_of_trade_finance.jpg" alt="Benefits Of Trade Finance by FundInvoice" width="450" /></a><br /><a href="https://www.fundinvoice.co.uk/list_other/benefits-of-trade-finance-for-importers.html" >Trade Finance Benefits</a> by <a href="https://www.fundinvoice.co.uk/" >FundInvoice</a>. 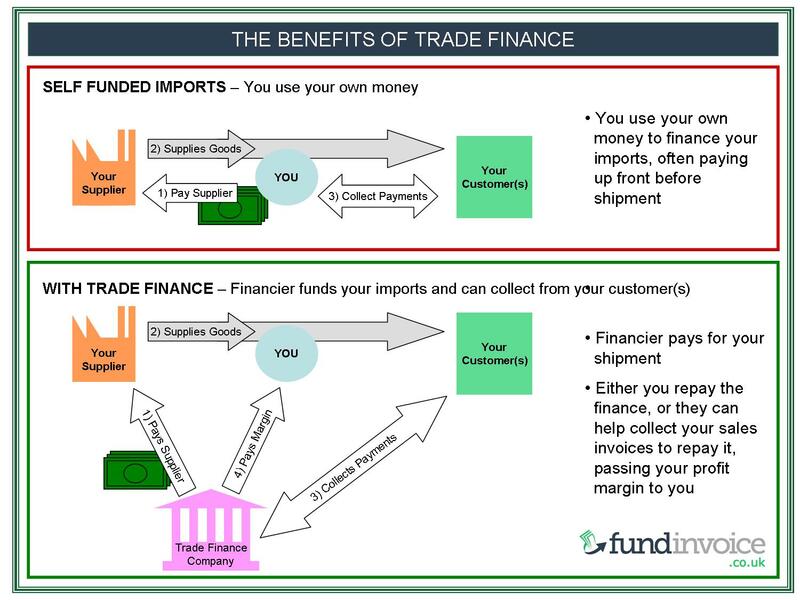 <a href="https://www.fundinvoice.co.uk/list_other/benefits-of-trade-finance-for-importers.html" ><img src="https://www.fundinvoice.co.uk/images/infographics/benefits_of_trade_finance.jpg" alt=" Benefits Of Trade Finance by FundInvoice " width="1000" /></a><br /><a href="https://www.fundinvoice.co.uk/list_other/benefits-of-trade-finance-for-importers.html" >Trade Finance Benefits</a> by <a href="https://www.fundinvoice.co.uk/" >FundInvoice</a>.